London has fallen, and it was knocked over by a bunny with a badge. The Thursday night box office numbers have come in and Disney’s Zootopia has come out on top with a $1.7 million take. Not only was this enough to put them on top of Gerard Butler’s London Has Fallen, but it was also enough to set a box office record for the Mouse House. Zootopia’s major Thursday night competition was the action sequel London Has Fallen which only managed to bring in $850,000. All signs have pointed to Zootopia having a huge opening weekend, something in the neighborhood of $60 million or more. This would finally break the three week grip that Deadpool has held on the domestic box office. The only other film opening this weekend is the Tina Fey led Whiskey Tango Foxtrot., but it’s not expected to contend for the top of the box office. Disney’s newest feature has been nearly universally loved by critics. After building up the positive reviews on Rotten Tomatoes over the last couple of weeks, the film finally has a single negative review on the site. We here at Cinema Blend were one of those who thought the film was very close to perfect. It’s a fun movie full of Disney’s trademark talking animals, but it also contains an analysis on modern American life that will resonate with adults. In this case the elephant in the room is Frozen, with over $400 million it has a huge lead over the rest of the pack. Only time will tell if Judy Hopps and Nick Wilde will resonate with audiences the way Anna and Elsa did. 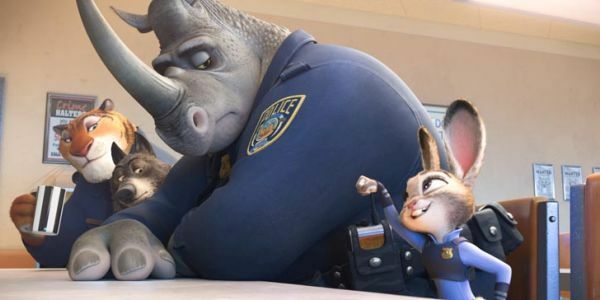 Will you be part of Zootopia’s opening weekend? Let us know if you plan to see it.